Diwali week is ever so busy in general, but more so for me this year as my maid decided not to come to work and to top it up came down with a bad flu and fever. So I nearly sat out this theme. What am I talking about? Its the FoodieMonday/Bloghop day. The #115th theme – Awadhi Cuisine was decided by Kriti who blogs at Krispy Kadhai. I was really in no mood or didn’t have the energy to really do any research on that cuisine. However, eat we all must whether sick or not and I had a huge slab of paneer staring at me whenever I opened the fridge. So, do you get those days when with much vigor and power you want to tackle all the jobs from top to bottom and from side to side? Well, I had one of those days…with a runny nose and a heavy head, tackled the house work, cooked lunch and baked a batch of cookies to give away as presents. I finally managed to turn the slab of paneer into an exotic sabji. 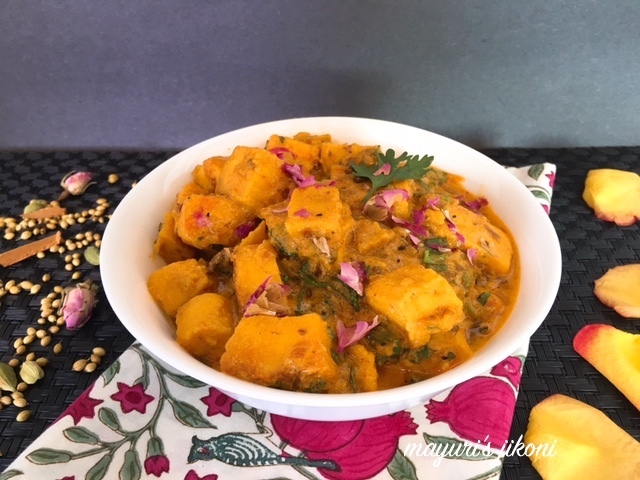 Paneer Kundan Kaliya…just the name had me saying wah wah wah! However take it from me, its one of the easiest to prepare. Just the name Awadhi and I think of long cooking procedures (dum) and a mile long list of ingredients. Then add the dos and don’ts and Awadhi cuisine sounds like a humungous task. I’m really not going to go into details about this cuisine as one can easily google it. All I read was that certain strong spices were never never mixed with subtle fragrant spices…like say rose is not mixed with garlic. Just briefly, Awadh is an area representing Lucknow and near by places. Awadh has been greatly influenced by Mughal cooking techniques. The bawarchis of Awadh gave birth to the dum style of cooking. Awadh cuisine is all about using the best quality ingredients, a variety of spices and and a balance of taste. Awadhi spread includes kebabs, kormas, biryanis, kaliyas, zardas, kulchas, sheermal, roomali rotis, halwas to name a few. The original kundan kaliya is mutton prepared in a gravy which must have turmeric or saffron and the mutton pieces were wrapped in gold leaf and served to the Nawabs. Being a vegetarian I decided to replace the mutton with paneer and I don’t use silver or gold leaves or foils for cooking. I hope you enjoy my version of kundan kaliya. Soak the saffron in hot milk for 15-20 minutes. Mix Kashmiri red chili powder and turmeric powder in a big mixing bowl. Slice the paneer into cubes or long slices, whichever you prefer. Add the paneer to the Kashmiri chili and turmeric powder mixture and coat each paneer piece well with it. Heat ghee in a wide frying pan over medium heat. Shallow fry the paneer pieces in the ghee. Don’t let the paneer become too brown. It should be a light golden brown in colour. Add cardamom, cloves, cinnamon, bay leaf and coriander seeds. Let the spices sizzle in the ghee for a few seconds. Add the finely chopped onions. Stir fry them till they become soft and become very light brown in colour. Add chopped tomato. Cook till it becomes soft. Add ginger paste, garam masala, red chili powder and saffron milk. Let the gravy cook till it becomes thick. Add the yogurt and keep on stirring for a minute or 2 two over low heat so that the yogurt does not curdle. Add rose water, rose petals and fresh cream. Mix the gravy well. Add paneer pieces and let the gravy simmer for 3-4 minutes on low heat. 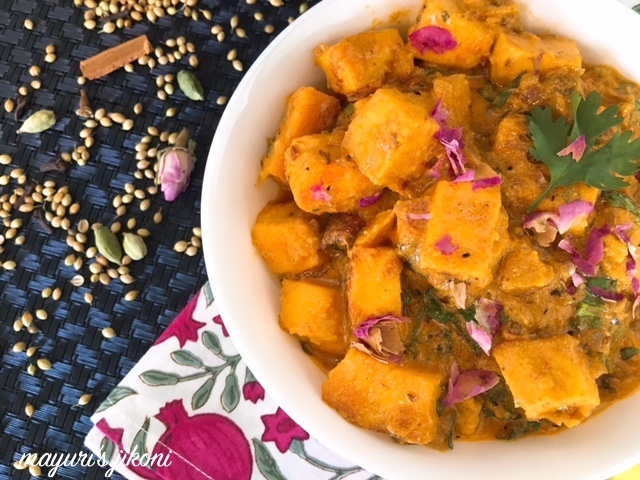 Serve paneer kundan kaliya with pulao, biryani or roti. Add gold leaf on top of the gravy before serving if you like. Make sure paneer is soft and not hard. This gravy does not have too many tomatoes. Drool drool… I am loving this rich aromatic paneer! Lovely share Mayuri. Loved the name kundan kaliya. Looks super tempting. Heard a lot about this dish.. I remember having seen it on food food channel too. Looks so rich and delicious. I love the exotic name given to it. Love the name, feels like you are in a jewellery shop :)sounds rich and delicious. 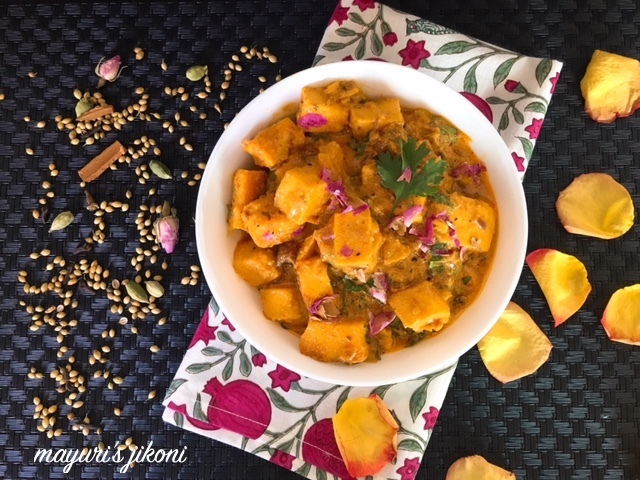 The paneer dish looks wonderful and tasty .The addition of the rose petals is very new to me and interesting addition I will try this next time I cook a paneer dish. You have given this dish full justice despite not feeling well. Wonderful share. I am sure it would have tasted delicious.Paneer is an all time favourite at my place.